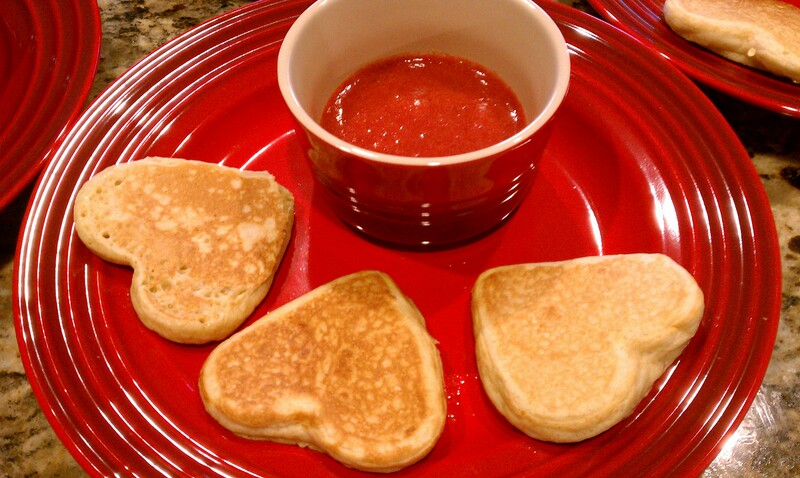 My kids have been pretty good guinea pigs through all this recent cooking of mine, and so it felt great to cook up their favorite for dinner on Valentines Day: pancakes. With NO vegetables. Plain, buttermilk pancakes made with healthy whole wheat pastry flour, and nothing hidden inside. They were thrilled. 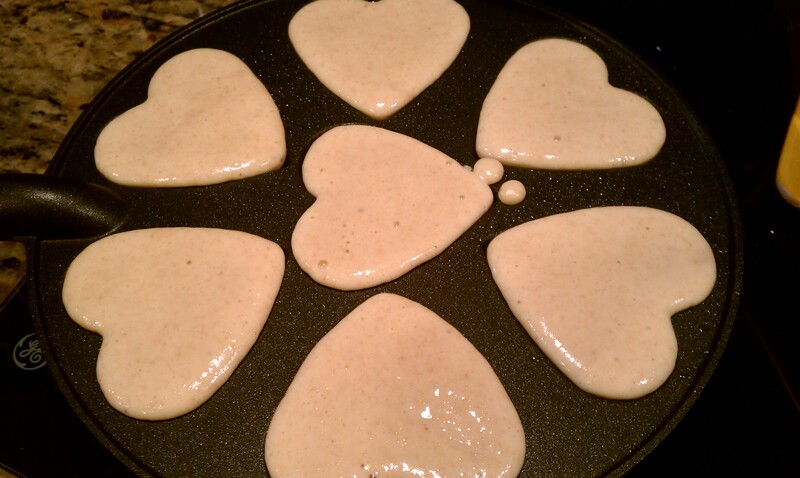 I was inspired by the fun Nordic Ware pancake pan I found at Target, which makes 7 mini heart-shaped pancakes. 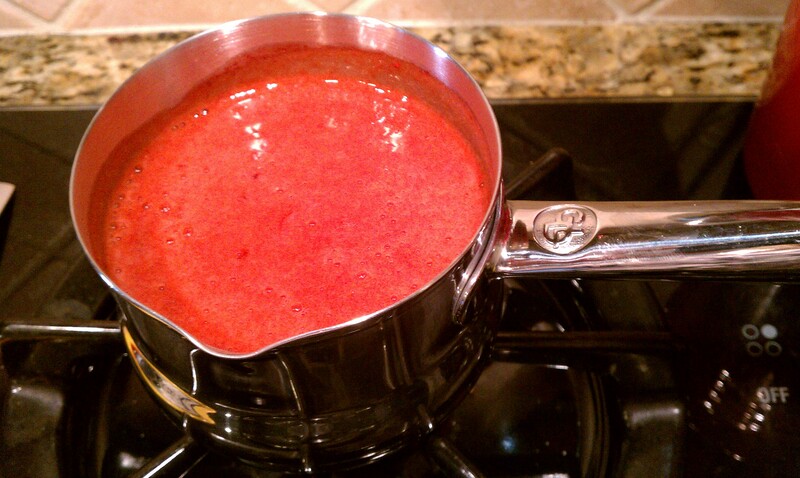 On the side I made a delicious strawberry dipping sauce, which tasted more like a smoothie (and it might as well have been a smoothie, as the kids ended up drinking it with straws…). Both recipes are from Ellie Krieger. My girls loved the mini hearts. I don’t consider myself to be the most coordinated person, and I wasn’t sure how I would flip those little guys back into their exact spots in the pan. So I flipped them into a second skillet, which also allowed me to have twice as many pancakes on the go. Ellie’s advice to keep the first pancakes warming at 200F while you cook the rest was perfect. The strawberry sauce was amazing, and so fitting for Valentines Day. I’ll admit that 2 tablespoons of pure maple syrup to a whole pound of strawberries wasn’t going to do it for our taste, so I probably used about 1/4 cup to make it sweeter. I could eat this sauce with just about anything — fruit, toast, maybe an old sneaker. And while this was the perfect and much needed change from routine, it will be back to vegetables tomorrow! There is nothing better than french toast on Sunday mornings. Being able to have it weekday mornings would be a major accomplishment, so cooking it ahead of time in muffin-form sounded perfect to me. 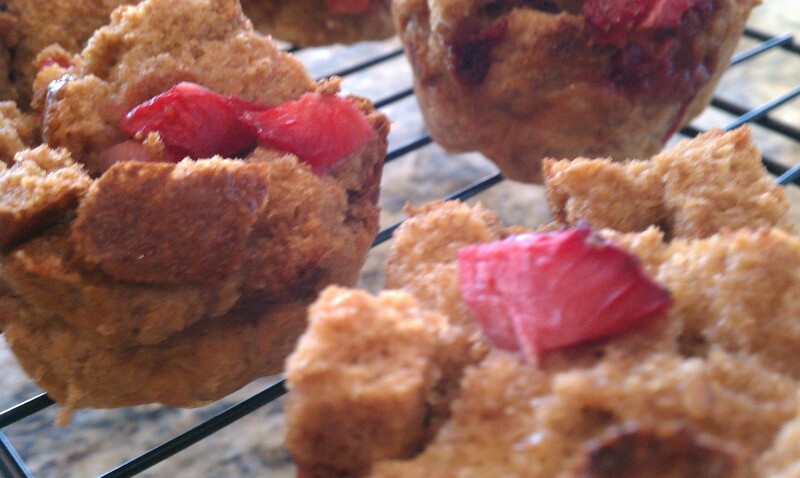 This French Toast Muffin recipe is a good one and relatively healthy; I didn’t change much — added extra cinnamon and used fresh diced strawberries instead of frozen mixed berries (I did this to appeal to my daughter Lauren’s taste, but since she picked around the strawberries anyway, I’ll stick to the nice assortment of mixed berries next time). Just pop the extras in the fridge and then heat them up for 20-30 seconds in the microwave. And of course, extra maple syrup drizzled on top is a must.